WordPress powers 25% of all websites in the world. Its immense popularity is not just because it’s so easy to use, but because it offers a plethora of useful plugins which allow you to add complex scripts to your site with the click of a button. With so many plugins to choose from, selecting the right plugins for your site can be an overwhelming task. In this article, we will show you 7 essential WordPress plugins that will help you generate more traffic instantly. Want to generate insane level of traffic to your blog from Twitter? 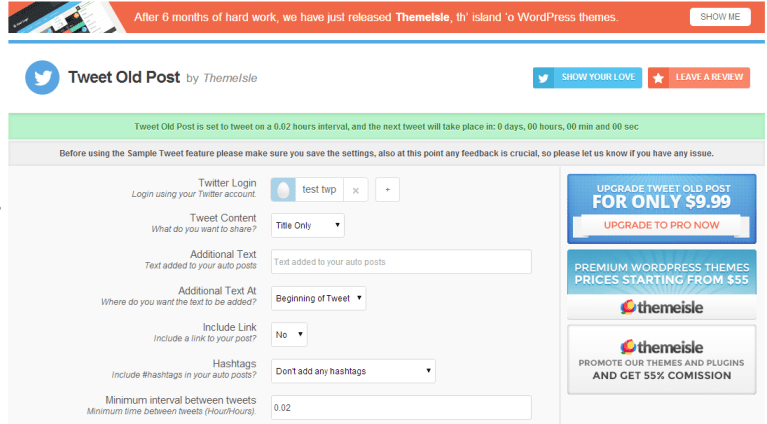 Then you need to use Click to Tweet WordPress plugin. Click to Tweet allows you to embed Twitter share boxes within your content in a non-intrusive way and makes it easier for users to share snippets of content within your blog posts. Driving search traffic to your blog is critical to your blog’s success. One way to optimize your posts for search engines is by using an SEO plugin. While there are tons of SEO plugins on WordPress, Yoast SEO is by far the most reliable one out there. This plugin allows you to optimize on-page SEO elements of your post (title tag, meta description, keyword density, etc.) and also provides technical SEO support. It’s one of the first plugins you should install on your new WordPress site. An effective method to drive traffic to your blog is through email marketing. So one of your top priorities should be turning your visitors into email subscribers. That’s where OptinMonster comes in. OptinMonster’s powerful drag & drop builder allows you to create visually stunning optin forms that are optimized for the highest conversion rates. From Sidebar to Welcome Gate Pop-ups, OptinMonster helps you to design elegant opt-in forms that prompt users to subscribe to your blog. One of the best features on OptinMonster is that it allows you to track user’s behavior and show them a targeted message at the precise moment they are about to leave (called exit intent popup), so you can convert them into email subscribers. In addition to this, there are tons of other features which make this the best WordPress list-building plugin on the market. You may have engaging content on your site, but if it’s not easily shareable, then you’ll lose out on a lot of potential traffic. Social shares play a chief role in driving traffic to your site. The more social shares your article has, the more likely it is to be shared on social media. According to research by Backlinko, social shares may also be one of Google’s 200 ranking signals to gauge content quality and relevance. Although there are several social share plugins, Share by SumoMe is the best, both in terms of design and functionality. It’s a part of the SumoMe plugin suite and the free version of this tool allows you to feature all the major social media channels on your social share bar. Inline Related Posts shows links to related posts inside your articles. This is effective for 1000-2000 word articles as users are already engaged with your content and more likely to check out similar content on your site. This also increases your page views and time spent on site by the user. Yet another highly useful plugin created by Team Yoast, Comment Redirect allows you to engage with people who comment on your blog by redirecting them to a page of your choice. Comment Redirect Plugin is an easier way to build your email list. Revive Old Post WordPress plugin does exactly what its name suggests – it revives your old blog posts which are dying a slow death in the archive pages. This plugin makes your old blog posts work for you by automatically sharing them on Twitter and Facebook at regular intervals. The above plugins can help you generate massive traffic, but keep in mind that you need to create and promote content on a consistent basis. Blogging is not a sprint, it’s a marathon. Growing your subscriber base and building credibility takes time time and effort. Having said that, the plugins featured in this article can make your task easier and ensure that your efforts are moving your blog in the right direction. Hope this article helped you find the essential WordPress plugins for your site. You may also want to check out these 5 SEO tools to drive traffic to your website. Don’t forget to follow us on Twitter and like our page on Facebook.